SYNOPSIS: This substantial project aims to create an entirely new perspective on what is a complex and convoluted history that produced a definitively Chinese silver category that until now has been much mis-understood by both Westerners and Chinese; a first Catalogue Raisonné for this important silver category. Qing Dynasty Silver should be regarded as being as important as Chinese ceramics, painting, furniture, jade etc are to Chinese cultural history. 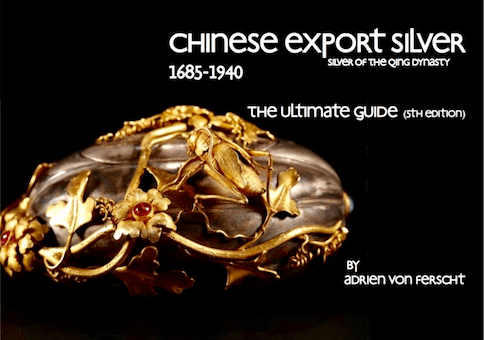 Qing Dynasty silver [aka: Chinese export silver] was in many ways a renaissance of Chinese silver making that spanned some 2200 years by the time the Dynasty fell in 1912 and the subsequent series of Republic era governments gave way to the People’s Republic. As the world’s oldest surviving civilisation, China may not be widely perceived as having been a historic producer of decorative silver wares, but the reality is that it has a heritage of silver-making longer than most nations – 2200 years to be exact. As with most countries that have a similar affinity with silver, China’s early decorative silver [Han – pre-Ming Dynasty] demonstrates influences from outside of China. The evolution of what eventually became a recognisable Chinese style to our eyes today was slow; it took some 1300 years, all of which were greatly influenced by silver brought into China along the ancient Silk Road by foreign merchants from nations such as Sassania and a series of political events in those nations that eventually culminated into a definitive Chinese style. Although that style was to further evolve over ensuing Dynasties, they all were within the confines of a natural evolvement of style that would be expected in any historic context, but it is without doubt that it was the advent of the Qing Dynasty and the extraordinary changes in foreign trade with China in the 17th and 18th centuries that brought about a silver making period that was to be China’s zenith. Chinese silver, however, is that it is an effective vehicle with which to demonstrate what is a very complex Chinese history at any point in that timeline and, unlike its European parallels, it is inextricably linked to China’s important place in international trade. During the latter part of the Ming Dynasty, the level of trade with the outside world was drastically reduced. This trend was reversed with the rise of the Qing Dynasty; a trend that dramatically kept rising as the 18th century moved into the 19th century and the phenomenon the West generally refers to as The China Trade developed into being a substantial world trade phenomenon, albeit highly complex and convoluted. Recent research now reveals that contrary to previously held beliefs, the Ming Dynasty produced some extremely fine pieces of decorative silver items that seamlessly influenced the silver wares of the early Qing Emperors; sadly few examples of Ming silver managed to survive. The late Ming and the early Qing Emperors were additionally influenced by the acceptance of certain European Jesuit scholars at court, influences that all too prominent in the exquisite gold and silver-gilt boxes of the early Qing Dynasty that rival contemporary boxes produced in France, Russia and England for imperial and royal households and their courts. Cultural influences on the decorative arts were by no means a one-way phenomenon; the style that became known as Chinoiserie arose in the mid-17th century across the European continent. At the same time, the Qianlong Emperor and his Jesuit court protégé Castiglione were creating a baroque-influenced summer palace in Beijing. Decorative art styles have never been containable to one single nation, but in the 17th century the extent of artistic exchanges between the West and China and vice versa reached new heights. This was not just down to a handful of prominent activists; international trade and its very momentum created the wherewithal for it to happen. SYNOPSIS:An important cross-cultural Scotland-China-Eurasia project. 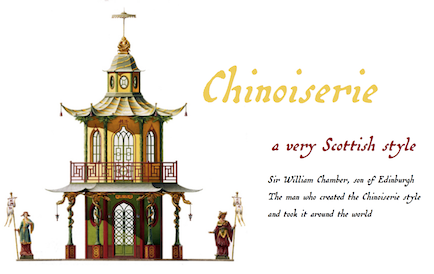 Sir William Chambers (1723-1796), son of Edinburgh The man who created the Chinoiserie style and took it around the world, including China. The Chinoiserie style swept Europe in the late 17th century and remained in vogue during the entire 18th century and the early 19th century; Royalty, imperial households and the aristocracy was where it proliferated; Catherine the Great, Frederick the Great, George Prince of Wales, Louis XIV. Ferdinand I, Carlos III all embraced it. As a style, it is a natural fit with the rococo style, exuberance and fantasy being its mainstays; Thomas Chippendale, John Nash, William Alexander, John Linnell were its proponents. It was, after all, a fantasy interpretation of a mystical Cathay. Robert Adam, Adam Smith and Charles Cameron endorsed it. Unbeknownst to many, at the height of its fashion, the Qianlong Emperor was equally obsessed with its antithesis; Euroiserie. The emperor was busy building an extension to the Summer Palace in Beijing in the European baroque style with Chinese overtones. His muse was the Jesuit priest Giuseppe Castiglione who was responsible for revolutionising Chinese style and painting, which was to remain an ongoing process throughout the Qing dynasty. China, the largest nation on earth and Scotland, one of the smallest nations in Europe, have had a remarkably special relationship that, on the face of it, may seem highly unlikely; it has lasted longer than Scotland’s union with England. The Scots’ affinity with the Chinese fuelled the fascination for all things oriental, and so a hybrid style was born. 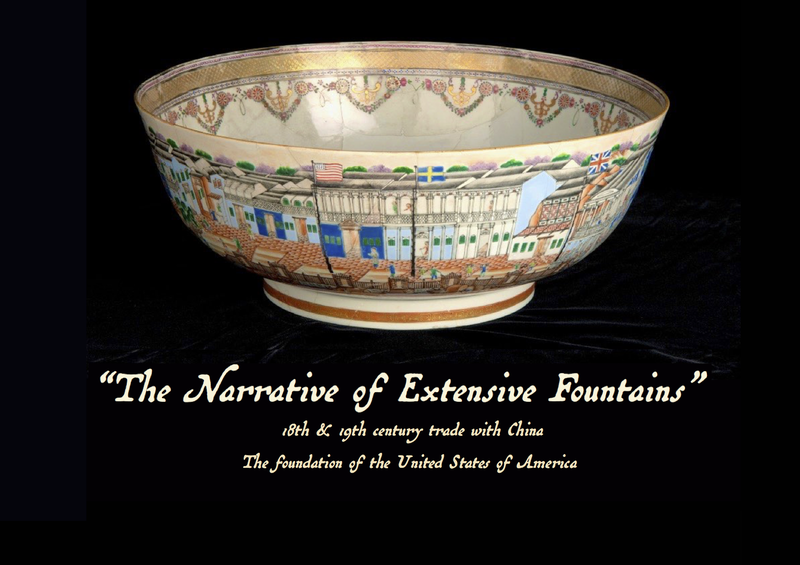 AN IMPORTANT RESEARCH PROJECT, aiming to create an alternative perspective of the American involvement in 18th & 19th century China Trade in the context of that trade phenomenon and the nascent American nation. In all the complexities of the China Trade, it was the activities of the American merchants that caused such a stir back in their recently nascent nation, far in excess of other trading nationalities in their home countries. East coast Americans, in particular, embraced the China Trade – the successes of its merchants and their families and the Chinese export merchandise that flooded in became a landmark in early American history; given America was in so many ways only just learning to walk unaided, the China Trade is far better looked upon as having been an integral part of early American history rather than some detached phenomenon far from its shores. It is probably because of this, those merchant families and their communities had such pride in those early commercial achievements and, despite the Chinese-ness of so much of the merchandise, it became Americana, rather than simply being Chinese objects in a foreign land. Many of those merchant families went on to be the instigators of investment and development of the much-needed infrastructure that created the America we know today; the railroads would be a fine example. Unlike any other participating nation in the China Trade, in the context of America, that trade phenomenon came to be regarded as quintessentially American. The American Factory at Canton, as with all of the foreign factories, bore a Chinese name; the “Hong of Extensive Fountains” or Gwong Yuen Hong 廣源行, an appellation created by the Chinese merchants intended to denote wealth and prosperity and named, in this instance, for the fountains in front of the building between it and the Pearl River [Zhujiang]. As the world’s oldest surviving civilisation, China may not be widely perceived as having been a historic producer of decorative silver wares; the reality is it has a heritage of silver-making longer than most nations – 2200 years to be exact. 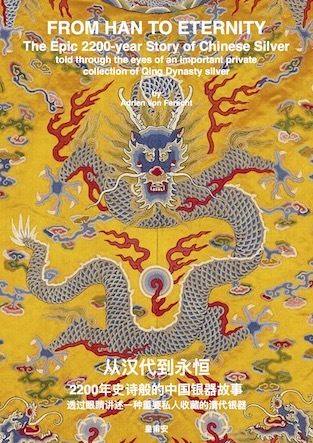 As with most countries that have a similar affinity with silver, China’s early decorative silver [Han – pre-Ming Dynasties] demonstrates influences from nations and empires that loosely lay along the ancient Silk Road, strongly suggesting they had a connection in some way to trade. In the 17th century, the influences came mainly from Europe by way of what has become known as The Maritime Silk Road and through Jesuit missionary figures who gained favour at court. This immediately raises a conundrum of sorts – whether international trade promotes artistic and cultural exchanges or vice versa; not a simple puzzle to fathom, especially when, the the context of China, the trading was of itself complex. Chinese silver, though, is a particularly effective vehicle with which to demonstrate what is a very complex Chinese history at any point in that timeline and, unlike its European parallels, it is inextricably linked to China’s important place in international trade. During the latter part of the Ming Dynasty, the level of trade with the outside world was drastically reduced. This trend was reversed with the rise of the Great Qing; a trend that dramatically kept rising as the 18th century moved into the 19th century and the phenomenon the West generally refers to as ‘The China Trade’ developed into being a substantial world trade phenomenon, albeit highly complex and convoluted. Individual foreign trading nations at Canton may have had differing China Trade timelines; in the context of America, it began in 1783 following the Treaty of Paris following Anglo-American the cessation of hostilities from the American Revolutionary War, effectively releasing all American trade from British control. The first recorded American voyage to Canton under this new regime took place in 1784 when the re-fitted and renamed Boston-built privateer sailing ship Empress of China reached Canton, having sailed from New York harbour on February 22nd, 1784 – George Washington’s birthday. By the time of the first American vessel’s arrival at Canton, several European trading nations had well-established trading factories, the English, French, Danish and the Dutch among them, each having their own China-trading start date and a collective trading hierarchy had been established, the English being by far the most dominant. Spanning the centuries of the various dynasties, China not only absorbed ideas and practices from outside but was also transplanted Chinese ideas in the West. In 1829, for example, the American banking and insurance systems were based on the Canton System of trade as a direct result of American merchants witnessing at first hand a re-devised system that dealt with a crisis in Canton that had the capability to put right an American banking system that was in crisis in New York. The very same system later became implanted in Europe, yet it is rarely recognised that Manchu China had such a profound influence on financial systems in the now affluent Western world. 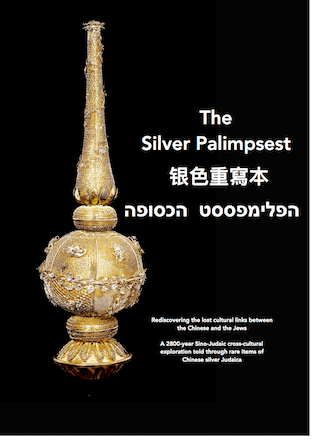 A detailed introduction and explanation of this unique, diverse and much mis-understood silver category; probably one of the largest silver categories in the world, spanning 255 years – the last silver category in the 2200 year history of Chinese silver-making. As a body of work, many of the long-standing misconceptions that have arisen over the years will be clarified; the historical evidence of how the phenomenon came into being and how it existed and interacted alongside silver that was made for the China market will be presented clearly. 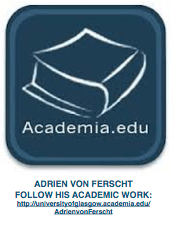 Adrien von Ferscht is now in the 8th year of his intensive research into this complex silver. This new edition will reflect the many glass ceilings of information that have been smashed since the 4th Edition was launched in 2015. Given the multi-disciplinary nature of the collective research areas, it has been found that the written findings of the research is an excellent vehicle with which to communicate so many areas of Chinese culture, both historical and present. The inclusion of Adrien von Ferscht on the Academic Committee of the Academy for International Communication of Chinese Culture at Beijing Normal University has boosted the ability to communicate various aspects of Chinese culture dramatically more effectively.